August is “American Artist Appreciation Month” continues. Here are two artists on the “cutting edge” of their time. I’ve posted my admiration for Zoe Strauss’ work before. There’s so much about this artist that broke the mold when she first started exhibiting Inkjet prints of her digital photos under the I-95 overpass in Philadelphia (2001–2010). The artist has a genuine interest in and empathy for other people’s lives, and it certainly comes through in her work. This South Philly series comes from her first ten years as a photographer documenting the people and scenes of her hometown: Philadelphia. 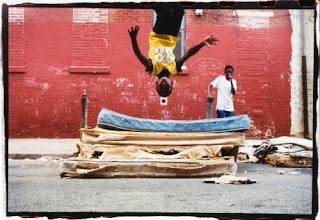 Strauss’ work does not exploit the poor and working-class people she documents. Rather, her work is an on-going statement about the struggle in everyday life and the beauty that can be found in that struggle. Despite the fact that she focuses on often-bleak aspects of city life in her Philadelphia photos, she is always able to find joy in moments such as this photograph. Strauss graduated from the Philadelphia High School for Girls and then took courses at Temple University in history and women’s studies. After leaving Temple, she discovered that she had a yearning to make art and began art projects of all sorts. She ultimately found a compelling interest in photography, finding that photographs can have powerful physical and visual effects on people. Her photography represents her desire to present as many of the varied experiences of life as possible. 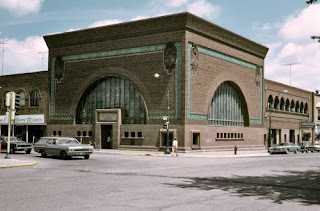 If you are from Chicago and an art historian, as I am, Louis Sullivan is one of your heroes. 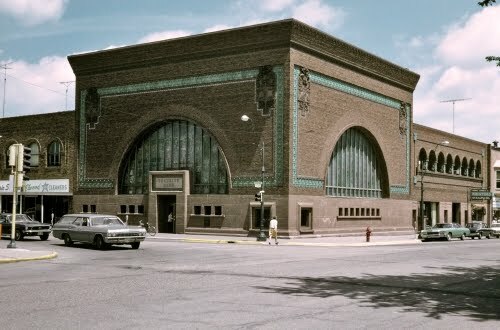 He’s not a “big star” architect like Frank Lloyd Wright (1867–1959)—who called Sullivan his “master” and “mentor”—but he really did help change modern architecture from high-rise historical revival to unique, exciting designs. Now, I’m a big fan of the Sullivan Center (formerly Carson, Pirie, Scott, and Company) in Chicago, because it was such a breath of modernity when it was designed. However, I am really a big admirer of Sullivan’s smaller designs because it is so easy to see his distinctive touches. This bank is one of eight regional Midwest banks built by Sullivan as his career was winding down after the Sullivan Center commission. The design of this series of banks has been called “jewel box” by some art historians, because they all bear the similar box-like design with wings. It is basically a large cube-shaped room, flooded with the colors of green, amber, and brown from the leaded glass arch windows. The facades are framed with greenish-glazed terracotta panels with typical Sullivan combinations of stylized floral and geometric patterns. Sullivan established his own office in Chicago after leaving Adler and Sullivan in 1895. His biggest commission in that office was Sullivan Center in 1903–1904. After that, commissions became fewer and fewer. A banker named Carl Bennett in Owatonna, Minnesota—who happened to be a disappointed aspiring musician—took over his family’s bank and decided to commission Sullivan for the design of a new one. Bennett wanted to combine his family’s business with his interest in art. At one point, Sullivan promised that the interior would be a symphony of color. Compared to the boring, classical revival style of most banks of the period, Sullivan’s jewel boxes really stand out. Wouldn’t you love to do your routine banking in a lobby flooded with colored light from these big arch windows? See more proof of Sullivan’s genius, the windows of one of the big arches at Owatonna.